Experience Yhe TRU Difference With Our Transparent Supplement Facts Panel Disclosing Full Clinical Doses For 13 Different Active Ingredients!Increase Pump And Endurance! No Proprietary Blends! 13 Scientifically Dosed Ingredients! Do you like to know what you’re taking, and how much you’re taking? Does your pre-workout leave you guessing? That’s the TRU difference. No proprietary blends. No deceptive dosing. No filler. Just a massive 23g serving comprised of 13 proven performance enhancing ingredients. Each ingredient in TRU Pre has been dosed according to clinical studies establishing effective doses for sports performance. Most pre-workout supplements rely heavily on stimulants and under dosed proprietary formulas to fool you into perceived “quality”. 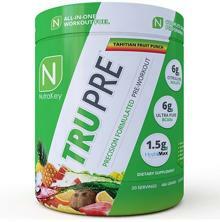 With 13 precision formulated ingredients, TRU Pre provides your body and mind with a clinical advantage to get the absolute most from your training. Don’t waste another training session with under dosed pre-workouts. 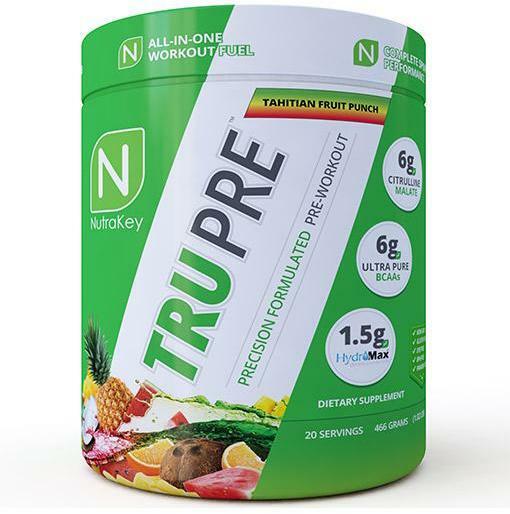 With a single scoop, Tru Pre primes your body with PROVEN performance enhancing ingredients to greatly improve recovery, blood flow, endurance, energy, and focus. In clinical studies Citrulline has demonstrated the ability to enhance blood flow, reduce fatigue and improve strength. At a dosage of 3.2g, Beta Alanine decreases lactic acid in the muscle, greatly improving physical performance and endurance. These anti-catabolic amino acids decrease muscle breakdown and dramatically increase protein synthesis. Betaine has shown to increase physical output and delay muscular fatigue during exercise. This amino acid enhances mental performance, nutrient uptake and promotes fuller muscles during exercise. This amino acid is critical for supporting bodily functions such as cognitive processes, building muscles, cell growth and recovery. Taking N-Acetyl L-Tyrosine before training can support peak performance from both your brain and body by alleviating stress, stimulating your mind and improving neural communication during training. Choline is the direct precursor for acetylcholine and can improve your cognitive performance. Acetylcholine also has stimulant effects in your brain, supplying more mental energy and alertness. Taking caffeine prior to a workout can help promote endurance and a lower rate of perceived exertion (RPE) during exercise. Caffeine can also increase the amount of adrenaline in your system, causing a rush of extra glucose and oxygen to your muscles to enhance physical performance. Piperine is able to increase bioavailability of many substances by inhibiting several enzymes responsible for metabolizing nutritional substances. Thus, increasing the absorption of nutrients taking with it. By preventing the breakdown of acetylcholine, Huperzine A can greatly increase cognitive performance and improve your “mind-muscle connections”. Supplementing with Huperzine A prior to working out is key in achieving maximum focus and concentration.